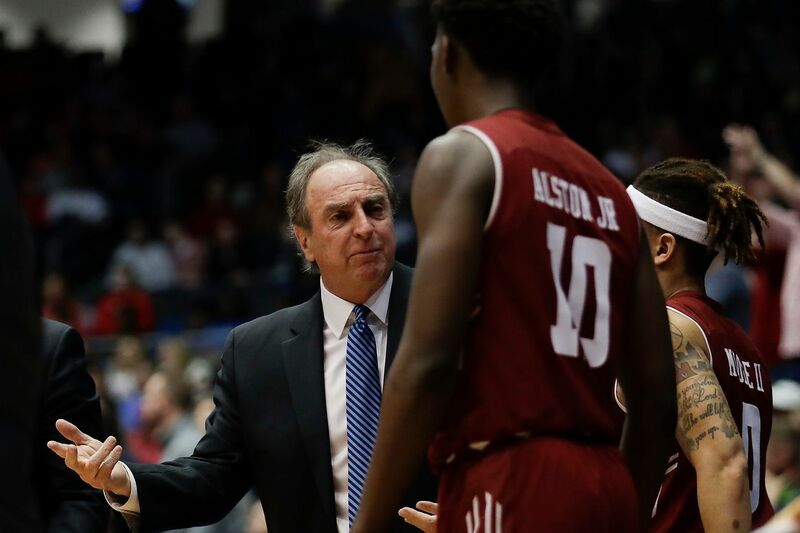 Temple coach Fran Dunphy talks to his players during the second half against Belmont on Tuesday. The NCAA play-in game, University of Dayton Arena — Dunphy’s last game in a three-decade run as a Big 5 head coach? The same day word went out that Phil Martelli was suddenly out at St. Joseph’s after 24 years? Could two such consequential eras really end the same day? Could, did. Black Tuesday. A day that will live in Big 5 infamy. Final score Belmont 81, Temple 70. If you stayed up, you saw the way this played out. Never mind Belmont, a little school in Nashville, Tenn., that keeps doing big basketball things — maybe this was destined to be. For all his successes, Dunphy never had an NCAA run. So finishing out here, it wasn’t pretty. But it was emblematic. The Aaron McKie era at Temple has officially begun. Owls senior guard Shizz Alston, who had practically willed this group into the NCAA Tournament, had shot the Owls into a second-half lead, but, just as suddenly, his shots began finding the front rim — a runner that he worked to get, 4 minutes left, didn’t make it even quite that far. It was as if the massive efforts of a full season finally had weighed on him. Missed free throws added up, too. The question was, could Temple score enough to keep up with Belmont? Asked, answered. Belmont was not the type of team that beats itself. These Bruins from the Ohio Valley shot 50 percent for the season and, sure enough, a few minutes left, they were shooting 52.9 percent. For those Temple alumni who declined to be fans of this team, wanting the Dunphy era to end, you win. It’s over. You got the proof you wanted. Temple forward Justyn Hamilton dribbles the basketball against Belmont guard Dylan Windler (right) and center Seth Adelsperger during the first-half in the NCAA First Four at the University of Dayton Arena in Dayton, Ohio on Tuesday, March 19, 2019. Give the Owls credit for what you saw right after halftime. If they didn’t show a little heart right there, they would have been blown out of Ohio. They showed a lot. Belmont had gone up 11, just over a minute into the half. Quinton Rose missed a couple of free throws. This just wasn’t happening for the Owls. Then Alston hit a three, and Temple’s defense was certainly responsible for a couple of missed Belmont threes, and a turnover on the break. Alston hit a corner three. When he hit another, the game was tied, 46-46. Another steal. … Nate Pierre-Louis dunk. 48-46 Owls. A big factor: Ernest Aflakpui controlling things inside. He’d gotten two quick fouls in the first half. No coincidence his presence was felt at both ends. The Owls kept going, up five. But a Temple pass bounced against the scorer’s table. Quick as that, the Owls were down four. Alston had missed a runner and a couple of threes. There were no more runs to be had. For Temple, even the first minutes were … troubling. Shots weren’t falling. Belmont hit a couple of threes that put that group in a comfort zone. Also, a Belmont guard, Kevin McClain, kept dribbling deep into the teeth of Temple’s defense, causing havoc. The Owls added a couple of missed free throws. The whole thing added up to 8-2, Belmont. But the Owls hung in and turned it right around, first by getting to the rim, wings and big men. That may have softened up Belmont, because Alston hit a pull-up 18-footer around a screen and then a three on a feed from Rose. A Belmont turnover produced an open J.P. Moorman in the right corner and he hit a three for a 22-17 Owls lead after a 14-2 run. At that point, Temple was 9 of 15 from the field, with just one turnover. By halftime, the Owls had made 13 of 32 shots, and 4 of 17 for any stretch of an NCAA game causes you problems. Temple coach Fran Dunphy walks off the court after losing to Belmont, 81-70, in the NCAA First Four at the University of Dayton Arena in Dayton, Ohio on Tuesday, March 19, 2019. Toward the end of the first half, giveaways also started to add up for Temple. A missed easy one inside. A lazy pass out front. The worst one: Belmont missed a shot, nobody but Temple guys around for the rebound as the ball headed toward the baseline. If it went out of bounds, Temple ball. Unless a Temple player decided he had to grab it, was off balance as he went out of bounds, and fumbled the ball OB. Pierre-Louis shook his head at himself. Belmont, up 30-27, had an extra possession. But Pierre-Louis wasn’t the type to hang his head. He stole the ball right back from Belmont’s Dylan Windler, kind of a snarl on his face. Still, the best player on the court in the first half belonged to Belmont. McClain had 13 points, including a quick cut to the hoop with 3 seconds left, the visitors up 37-31 at the break. At halftime, the AT&T At The Half crew was talking about Belmont’s 11 assists on 15 baskets. Story of the night to that point. They weren’t talking about the last game for Dunphy. But the things they were talking about added up to it. At the very end, last minute, Alston kind of looked around his half of the arena for a moment, taking in a career for the last time. His coach stood at midcourt, coaching the last possession, coaching to the end of his career, his team down 9, 30 seconds left.